Reference number for this case: 10-oct-54-Saillat. Thank you for including this reference number in any correspondence with me regarding this case. Jacques Vallée indicated in his catalog of the 1960s that according to the newspaper Le Figaro for October 13, 1954, on October 10, 1954, at dusk, in Saillat-sur-Vienne, Roger Gayout and his family saw a very bright object approaching very close to the ground. Oct. 10, 1954, nightfall, Saillat-sur-Vienne (France). Roger Gayout and family saw a very bright object come very close to the ground. (56; M 162) (Le Figaro, 13 oct 1954). The author indicates that on October 11, 1954, at nightfall, a very shining object approached the ground in Saillat-sur-Vienne. It was seen by all the members of a family. [...] Saillat, in the Haute-Vienne, was the location of a landing on October 11, 1954. The two authors indicate that in Saillat-sur-Vienna in the Haute-Vienne, on October 10, 1954, a family saw at nightfall a very shining object which approached very close to the ground. Godelieve van Overmeire indicates that in 1954, on October 10, in France, in Saillat sur Vienne, "at nightfall Roger Gayout and his family saw a very shining object approach very close to the ground." She indicates that the sources for this are "Le Figaro, Oct 13, 1954" and "Jacques Vallée: 'Chronique des apparitions ET' - DENOEL 1972 - J'AI LU COLL. - p. 274, 275". She adds that "another version of the same author" is: "At 01:30 farmers were awaked by a whistle, and saw a flat object land close to the wood. Soon it rose very quickly vertically and flew away. The ground was burned. The police force took samples." The source for this is given as "Jacques Vallée: 'Chronique des apparitions ET' - DENOEL 1972 - J'AI LU COLL. - p. 275". 1954 - In the evening at Saillat-sur-Vienne, Haute-Vienne, France Mssr. Roger Gayout and his family saw a very bright object come very close to the ground. (Sources: Aime Michel, Flying Saucers and the Straight Line Mystery, p. 162; Jacques Vallee, Passport to Magonia: A Century of Landings, p. 223-224, case 229). 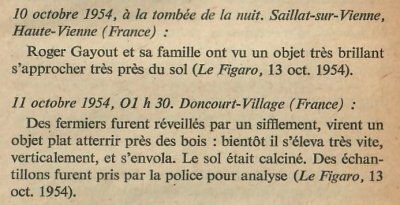 Jerome Beau indicates that on Sunday October 10, 1954 at "Nightfall: In Saillat-sur-Vienne (Haute-Vienne, France), Roger Gayout and his family see 1 very shining object approach very close to the ground." Jérôme Beau indicates that the source is "Le Figaro, October 13, 1954". 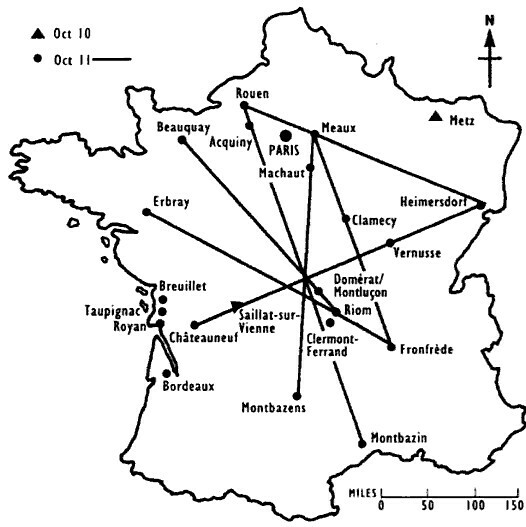 Luc Chastan indicates that in the Haute Vienne in Saillat sur Vienne on October 10, 1954 at an unknown hour, "a family see, at the fall of night, a very shining object approach very close to the ground." The website indicates that on 10 October 1954 at 18:00 in Saillat-sur-Vienne, France, "Roger Gayout and family saw a very bright object come very close to the ground." "At Saillat-sur-Vienne, France Mssr. Roger Gayout and his family saw a very bright object come very close to the ground." The website adds: "One ball was observed." The website indicates that on 11 October 1954 at 20:00 in Saillat-sur-Vienne, France, "An object was sighted that had an appearance and performance beyond the capability of known earthly aircraft. One object was observed by more than one witness on a farm for five minutes (Gayout)." The sources are indicated as "Michel, Aime, Flying Saucers and the Straight-Line Mystery, S. G. Phillips, New York, 1958; Bowen, Charles, The Humanoids: FSR Special Edition No. 1, FSR, London, 1966; Vallee, Jacques, Computerized Catalog (N = 3073); Vallee, Jacques, Preliminary Catalog (N = 500), (in JVallee01); Vallee, Jacques, Challenge to Science: The UFO Enigma, Henry Regnery, Chicago, 1966; Vallee, Jacques, A Century of Landings (N = 923), (in JVallee04), Chicago, 1969; Schoenherr, Luis, Computerized Catalog (N = 3173); Hatch, Larry, *U* computer database, Author, Redwood City, 2002." *Oct. 10, 1954 - At Saillat-sur-Vienne, France Mssr. Roger Gayout and his family saw a very bright object come very close to the ground just after dark. (Sources: Aime Michel, Flying Saucers and the Straight Line Mystery, p. 162; Jacques Vallee, Passport to Magonia: A Century of Landings, p. 223-224, case # 229). Roger Gayout and his family saw a very bright object come very close to the ground. Vallee Case 229 citing Figaro 13 October 1954. To call this vers succinct report a "UFO landing" is really an act of faith: it could simply have been a meteor fall, or the passage of a meteor behind the horizon. [---] Article in the national newspaper Le Figaro, Paris, France, October 13, 1954. [am1] "Flying Saucers and the Straight-Line Mystery", book by Aimé Michel, English version of "Mystérieux Objets Célestes", S.G. Phillips publisher, USA, page 162, 1958. [jv2] "The Humanoids: a survey of world-wide reports of landings of unconventional aerial objects and their alleged occupants", book by Charles Bowen, Neville Spearman publisher, U-K., 1969. [fl1] "Etude d'une relation possible entre les lieux d'observations et la présence de sources minérales ou thermominérales", article by Fernand Lagarde, in the ufology magazine Lumières Dans La Nuit, (LDLN), France, #116, page 8, February 1972. [jv2] "En quête des humanoïdes" book by Charles Bowen, french translation of "The Humanoids", J'ai Lu publisher, France, page 50, 1974. 0.1 Patrick Gross April 12, 2003 First published. 1.0 Patrick Gross April 18, 2009 Conversion from HTML to XHTML Strict. First formal version. Additions [go1], [jb1], [lc1], [ud1], [ud2]. 1.2 Patrick Gross October 29, 2011 Addition [dj1]. A search on the web and in my documentation did not reveal other sources. 1.3 Patrick Gross October 9, 2014 Addition [ta1]. 1.4 Patrick Gross February 21, 2017 Addition [ub1]. 1.5 Patrick Gross April 26, 2019 Additions [fl1], [mf1], [lh1], [pr2], Summary. Addition of the note in [go1]. Explanations changed, were "Not looked for yet. Possible meteor." This page was last updated on April 26, 2019.